Presentation Primary School is a large urban school located in Dublin City. The school is located along a narrow, busy commuter road and has over 600 students and 28 teachers travelling to and from the school every school day. Teachers: Two teachers were selected for the Green-Schools committee. This enabled the activities and meeting to run smoothly and continuously throughout the two years even if one of the teachers was too busy. Having more than one teacher on the committee also enabled sharing of ideas and tasks, and ultimately helped embed Green-Schools into different classes within the school. Students: It was decided that two students from each class representing second to sixth class would be selected for the committee. Those interested in signing up were asked to write a letter and give a short presentation to their classes as to why they wanted to join and the classes then voted in who they thought would best represent their class. 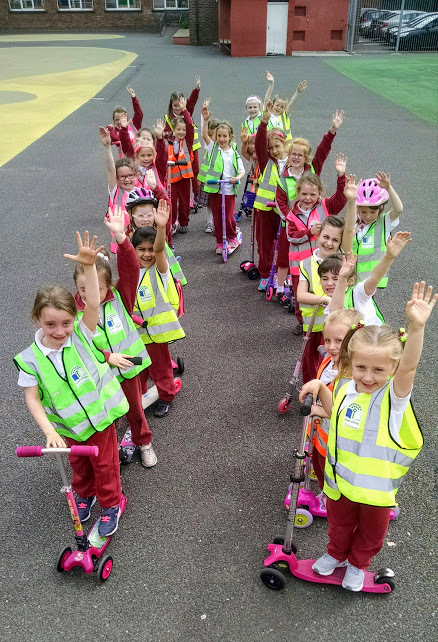 A hands-up travel survey was conducted by the school’s dedicated Green-Schools Travel officer in a number of classes to see how people travelled to and from the school. The results showed that almost 65% of students travelled to school by car making it by far the most common mode. The survey showed that 25% walked, 6% cycled and only 5% traveled by bus. 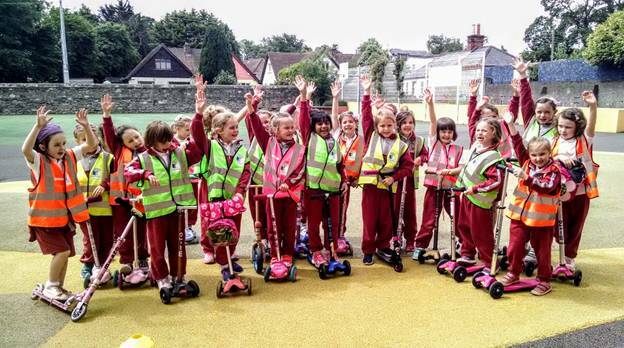 From these results it was decided that the school should focus on promoting walking, park ‘n’ stride and scooting. The committee also carried out a traffic count survey on the main road in front of the school. This was done to assess: how busy the road was, what types of vehicles pass, driver behaviour and car occupancy. It was noted that the road outside the school was extremely busy with constant traffic flow as well as a high level of double decker buses. 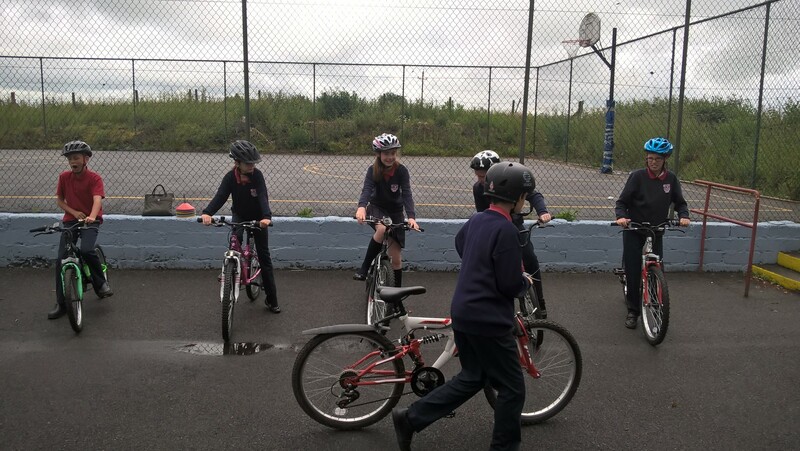 Due to this and the narrow roads it was decided that cycling would not be a good mode to promote in this school and promoting scooting on paths would be a safer option. 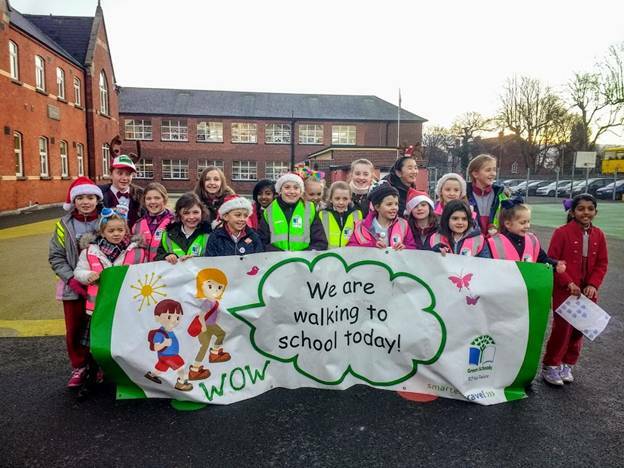 A walkability audit was also carried out by the committee accompanied by their Green-Schools Travel Officer. 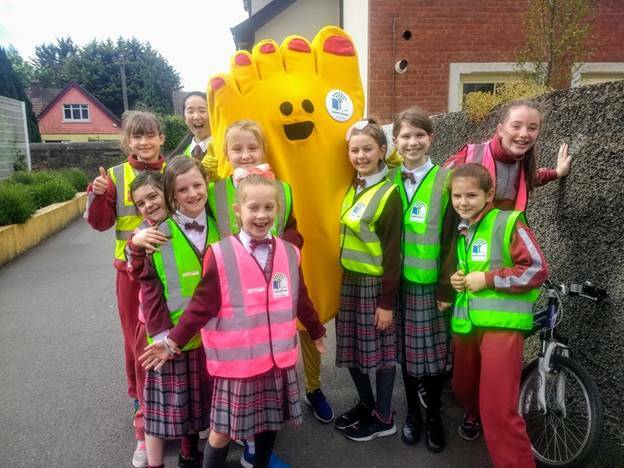 A route from the school along Terenure Road West and Templeogue Road was surveyed as most pupils travel along these roads on the way to school. A log was kept of the infrastructure surrounding the school: positives such as pedestrian crossings, footpaths, traffic calming and negatives such as trip hazards, lack of pedestrian crossings and obstacles. Suitable park ‘n’ stride locations were also noted and a report was done up to send to the local authority. In order to monitor and evaluate the school’s progress, ‘Scores on Doors’ (tallies) for each class were kept every Wednesday. From these a ‘Golden Boot’ award was awarded to a different class each week based on sustainable travel results. In addition to this, the Green-Schools Travel officer carried out travel surveys twice a year. These surveys showed an increase in walking from 26% to 40% and a reduction of car use from 63% to 10% from Year One to Year Two respectively. 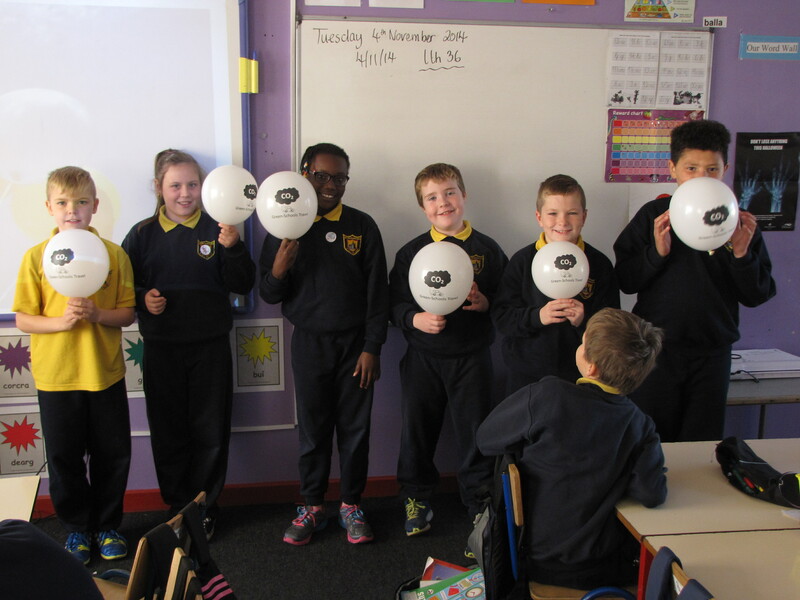 After the first year of the programme it was decided that an extra layer of fun needed to be injected into the monitoring do the committee set up a ‘Travel Destination’ target for the school to reach. Each person walking to school represented 1km distance travelled for the school. The school aimed to reach a number of destinations including: Longford, London & Paris. The school made efforts to link various subjects in with the Travel theme for instance; doing pie charts and bar charts to represent modes of travel for Maths, poster competitions and transport models for Art, road safety for SPHE, transport debates and creative writing for English, as well as skooter skills for PE. All teachers kept note of any travel related work they undertook throughout the year. 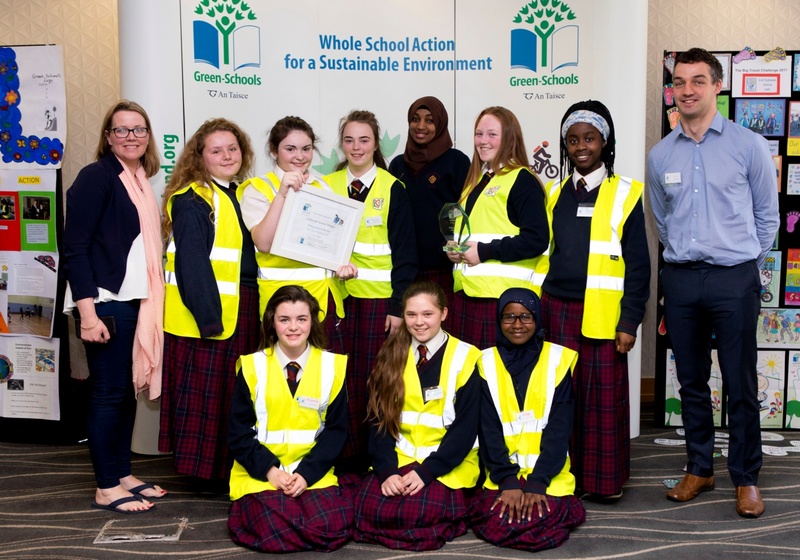 Informing and Involving aims to inform the whole school as well as the wider community of the Green-Schools work that is being carried out. To inform the pupils and teachers in the school, the committee regularly updated the Green-Schools notice board, gave updates at assembly, reported back to classes and used intercom announcements. 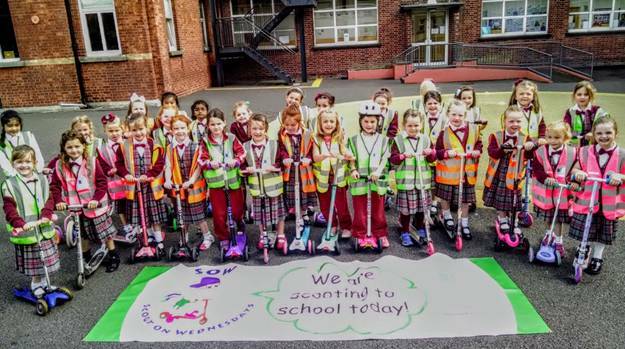 As well as having a number of mini action days and promotion of regular Walk / Scoot / Park n’ Stride on Wednesdays, the school carried out a number of actions to inform the wider community ongoing work. This included: letter drops to parents, ‘text a parent’, newsletters and regular updates on social media and the school website. 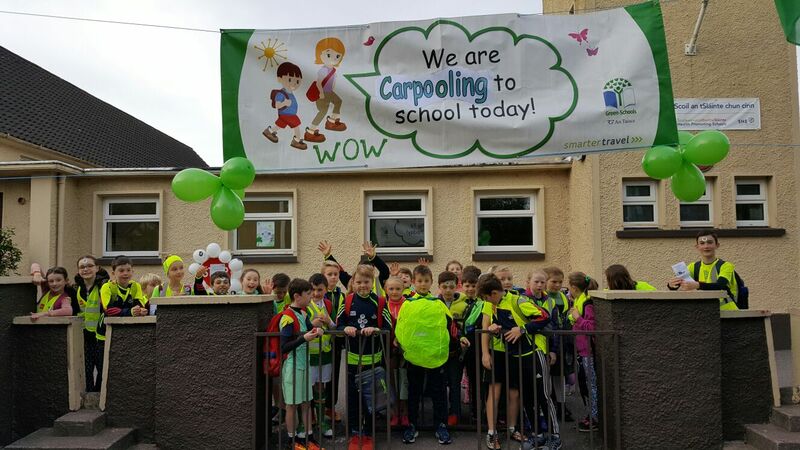 Watch Presentation Primary School celebrate National Walk to School Week on RTÉ’s news2day show. The school held a Green Code competition among all classes. From this two winning slogans were chosen and combined to form the Green Travel Code. The winning slogans were displayed around the school and chanted at assembly.